The FAFW3511KW is a 3.5 cu. feet capacity washer that comes loaded with intuitive and useful features such as WashSense and Advanced Rinse technology. The WashSense Technology makes sure that all garments are thoroughly cleaned. The Advanced Rinse technology allows you to give a final rinse to the load with a fresh batch of water to remove traces of odor and traces of soap and detergent residue. The Balance Control System reduces the vibration even with a full load. The system allows users to place the unit anywhere, even on the second floor. Express Select controls allows you to select controls and programs with one touch of a button. 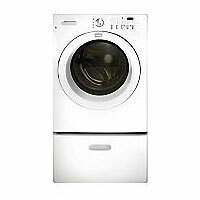 The Quick Cycle feature allows you to wash small loads of laundry with this feature for as quick as 25 minutes. The Add-a-Garment feature allows you to pop in a garment even when the machine is in the middle of the cycle. Simply put the machine on Pause and pop the dress in before turning the machine back on. The automatic water level adjustment means that the machine adjusts the water level according to the weight of the load, which means that you won’t have to do any of the guess work. The TimeWise Technology means that the machine’s wash cycles equal the dry cycles so there’s no need to wait. The Save Your Settings feature allows you to record your settings so your machine can automatically use it the next time you do the laundry. The Delay Start feature allows you to program the settings according to when it is most convenient for you to unload the laundry. Some users like to set the machine about an hour before they arrive home from work so that the laundry is done the moment they come home. The stainless steel drum resists rust and chipping paint. Rust and chipping paint can damage the clothes by causing discolorations and snags in the fabric, especially delicates. One of the main advantages of this machine is that it allows you to use saved settings for easy programming of the machine so you can just turn on the machine. It uses your saved settings automatically. Another advantage is the Delay Start, which allows you to program your machine in advance in order for you to have a fresh load of laundry waiting for you when you come home. The Balance Control System also makes the unit quiet so you can put it right next to the baby’s room. You can even put it on the second floor and the machine won’t make a racket. The loads often come out smelling of mildew if you do not clean the drum regularly. This is because of the retained water, lint, and detergent residue in the drum, which becomes an excellent breeding ground for bacteria and molds. Comments for Frigidaire Affinity Series FAFW3511KW 27in Front-Load Washer 3.5 cu. ft. I have had this for 3 years and is still constantly breaking down, i will never buy another frigidaire appliance in my life. My husband bought this washing machine (and matching dryer) as a surprise for me to replace my 15 year old top-loading machine. He bought it at H&H Gregg. The machine began to have problems after one month. It started with the drum not spinning. After fighting with H&H they covered the $300 + repair fee. Since then we have replace the door latch - twice. No warranty coverage. Just replaced the draining pump. $320. No warranty coverage. And was told the hinge on the door will need to be replaced soon. The door must be left open between washings to prevent nasty things from happening. I'm about to throw in the towel and buy an inexpensive top loader - 15 years and NOT ONE SERVICE CALL.